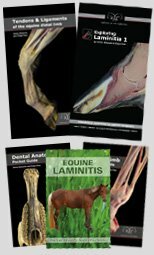 Exploring laminitis - photos of the internal tissues helps us to understand the impact this condition has on both the internal and external aspects of the hoof. 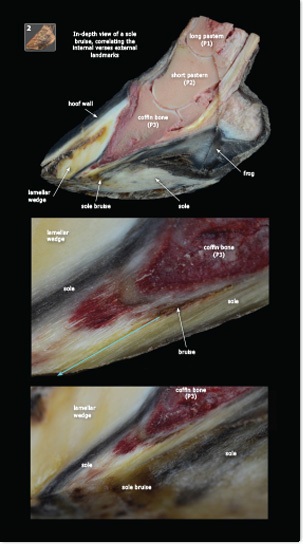 These photos open our eyes and minds to the devastation that can occur and allow us to determine when and where we, as professional hoof care providers can help rebuild the compromised hoof. Taking care of the laminitic horse is tough! Laminitic hooves do not grow "normally" and the photographic evidence shows us why. This helps us make informed decisions which benefits not only our clients and their horses but also our businesses. 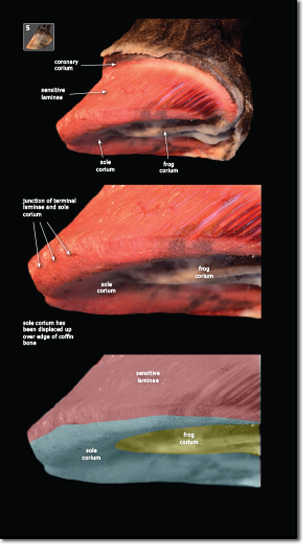 Understanding the underlying anatomy helps us figure out what is actually happening and provides inspiration for ways to help these compromised horses. 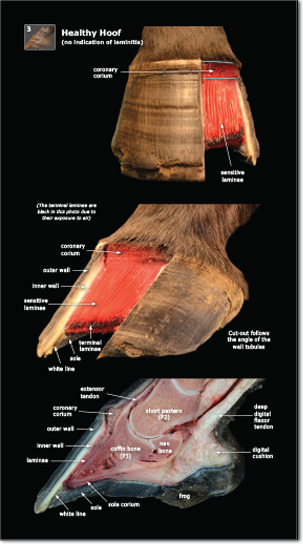 Laminitis is rarely just a hoof issue, but as professional hoof care providers, the hoof is our primary concern. 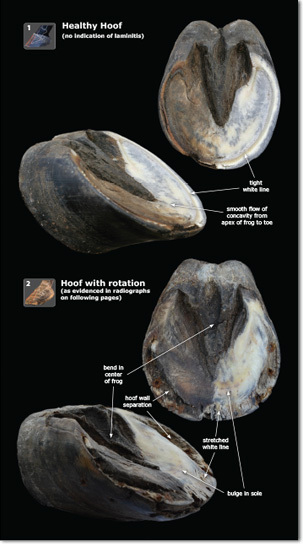 We witness the sometimes radical changes to the hoof capsule and know that these changes are not good. But why does the hoof distort so badly? How does this happen? 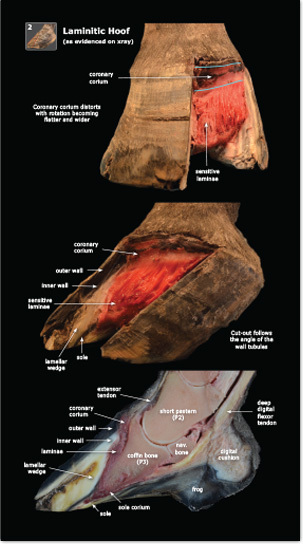 As farriers, we want to understand the mechanics of laminitis. 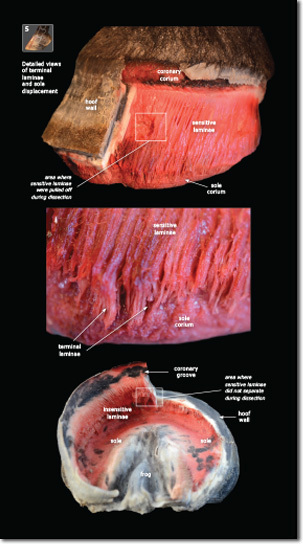 We need to make sense of the dynamic between the internal and external hoof and how these two components affect each other. Current imaging methods (digital radiographs, MRIs, etc.) answer some of our questions, but to actually see the soft tissues helps us get our heads around how they work together. 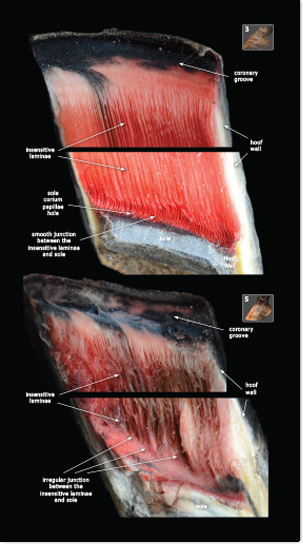 We couldn't find this information anywhere and so started dissecting and as a result discovered and photographed a goldmine of information lying just beneath the surface of the hoof. 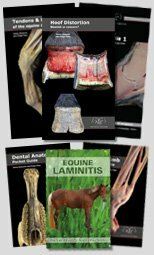 We put this information together into a world class package, Exploring Laminitis 1. 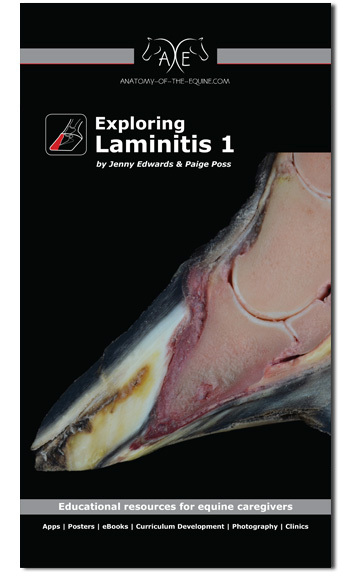 Exploring Laminitis 1 uses comparative anatomy in a quest to analyze the differences between a "healthy" hoof and one with a hoof with severe, chronic laminitis with capsular rotation. 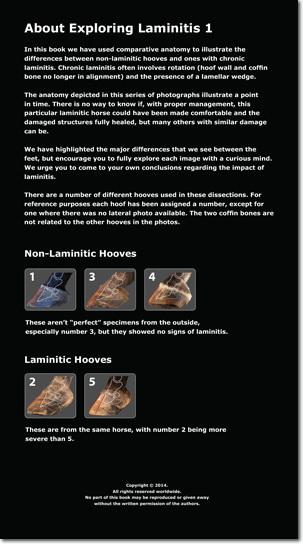 This is part one of a future series that will highlight the different types of laminitic hooves and show the variations that can occur. We cover some of it here, but you are going to want your own copy to study! The pictures are amazing and especially helpful for visual/kinesthetic learners. There is so much information that it will blow your mind! Plus much, much more when you engage your mind and explore for yourself! 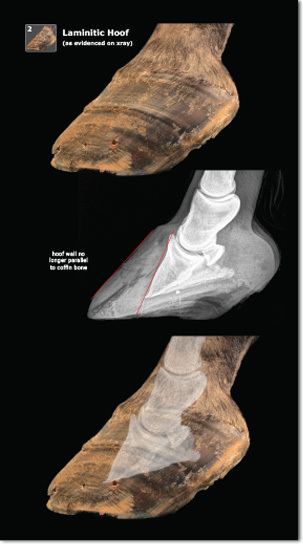 The first page compares the external views of a healthy foot verses a laminititc foot and highlights the common external distortions that occur when laminitis is present. The term 'healthy' is used very loosely in this book. 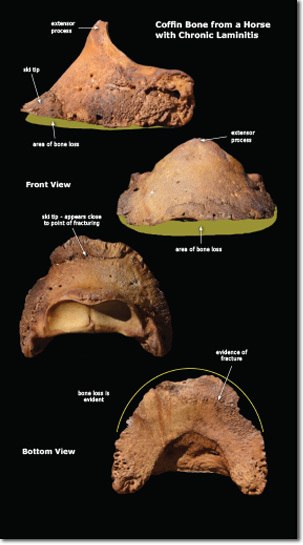 We specifically chose a hoof that looked suspect, but did not have internal changes. 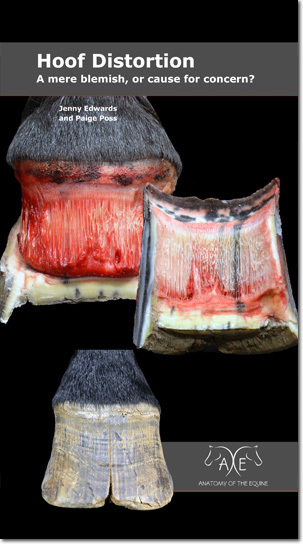 Using radiographs we show the location and orientation of the coffin bone within each of the hoof capsules on both the healthy hoof and rotated hoof. Next a window is cut out to reveal the laminae and coronary coriums. This really highlights the damage and distortion to both structures. 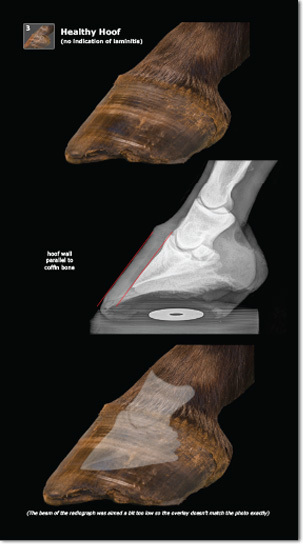 We also show a sagittal cut of both of the hooves which illustrates how much distortion occurs to the surrounding structures such as the digital cushion. 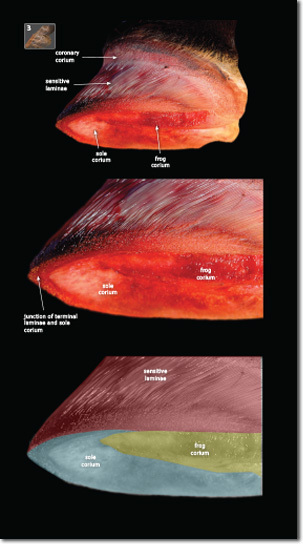 In this spread we take a closer look at the sagittal cuts and study how bruising migrates from the corium outwards through the sole. 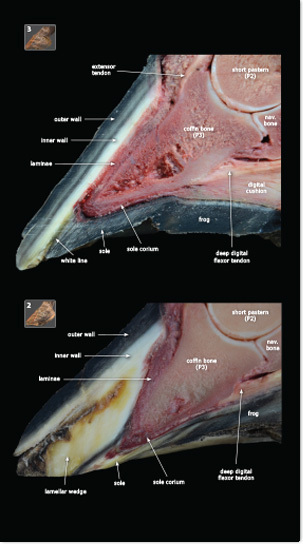 Comparing the inside of the hoof wall also shows the significant damage that occurs to the insensitive laminae. 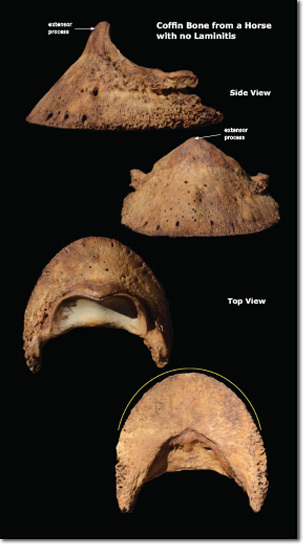 Here we can see how the sole corium has migrated up over the edge of the coffin bone which is how the sole also became displaced. The damaged and disorganized laminae also have damage to their ends, the terminal laminae. Finally we compare the coffin bones from both feet. 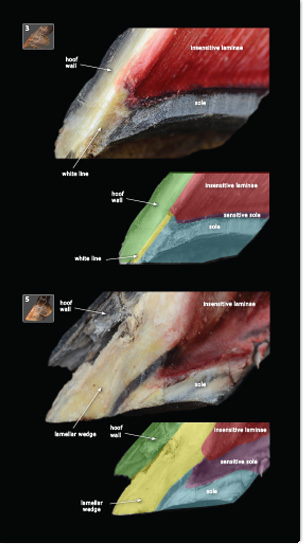 The laminitic hoof shows bone loss and remodelling and is on the verge of fracturing at the tip. Printed on heavy duty card and spiral bound to make this guide very rugged and easy to use as a portable teaching tool. 6"x11", 18 pages. Hi Paige and Jenny – congratulations on an excellent publication. I thoroughly enjoyed turning the pages and having the labels appear on the following page – a great initiative. The graphics and compositing are first class. 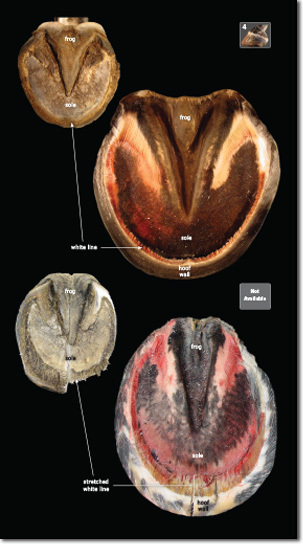 I am preparing a new edition of my own book to be retitled The Illustrated Horse Foot. I hope it matches yours in graphical impact. It will be in print first and later as an eBook. Got the Laminitis 1 today and WOW!!!!!!! I am beyond impressed. I will now proceed to make half of my clientele cringe, and hopefully make them think a little bit. An eBook is an electronic book that is compatible with any computer, laptop, smart phone or tablet. When you order the eBook you will be sent an email with a link to the download file - click on that link and make sure you save it to a place where you can find it again!